You may have to give Felix time to adjust to the new litter. Choosing the right cat litter to keep your finicky feline happy, without offending your nose, can be challenging. Fortunately, silica cat litter might make you both happy. Silica litter is highly absorbent and made from nontoxic silica gel, so you won't have to worry about your kitty's safety. Silica cat litters usually produce less overall waste than traditional clumping or clay litters. One bag is meant to last for about one month, for one kitty. All you have to do is scoop out any solid waste and mix up the crystals with the scoop, which is especially important if your purring pal tends to use the same corner every time. At the end of the month, simply toss out the dirty silica litter, thoroughly clean the litter box and replace with all-new litter. Since you're emptying the entire box only once a month, you'll be throwing out less trash from the litter, as well as the packaging. If you—or your kitty—find yourself sneezing each time you pour litter into the box, silica litter may be a better fit. Clay litters often swirl up a cloud of dust when you fill the box and then create other small dust clouds every time your furry friend digs a hole. Silica litters, on the other hand, are virtually dust-free. As an added bonus, silica can inhibit mold and bacteria growth by keeping the box dry, which is especially important if you're sensitive to these allergens. You head to the grocery store on your way home, fill the cart and then realize you forgot to pick up litter. Since the cart is already full, you wind up pulling the heavy bag off the shelf and then slipping it on the bottom rack. When you get to the register, you realize the bar code is on the bottom, so you have to bend down and turn it over. You're already exhausted, but when you get home you have to haul a 25-pound bag of cat litter up to the litter box on the second floor, which is a chore all on its own. Silica kitty litter comes in smaller packaging and is lighter in weight than its clay and clumping counterparts. Since it typically comes in a single-serving unit—meaning a one-month supply—you don't have to deal with the strain of carrying around a heavy bag. 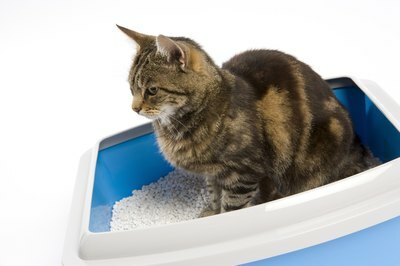 You need one litter box for each cat, plus one more, suggests the Humane Society of the United States. While silica litter can last for as long as a month, if you have multiple cats or a larger kitty who dirties the box quickly, you may need to change it more often. It can take some time for your furry friend to adjust to the new litter. Rather than going cold turkey and swapping litter overnight, use a mixture of clay litter and silica. The next time you change the box, use the mixed blend, but add more silica crystals. As long as your kitty tolerates the change, swap to straight silica litter. Some cats are finicky about scents. If your feline strays away from the litter box, opt for an unscented variety the next time around. What Cat Litter Does Not Contain Clay? How Long Should 20 Pounds of Cat Litter Last With Two Cats?